Day two started early early early with a 7:00am GLAMSQUAD appointment to create this perfect pony look! Then I headed all the way downtown to the Club Monaco presentation at the World Trade Center. The presentation was breathtaking! The views were absolutely incredible to say the least. 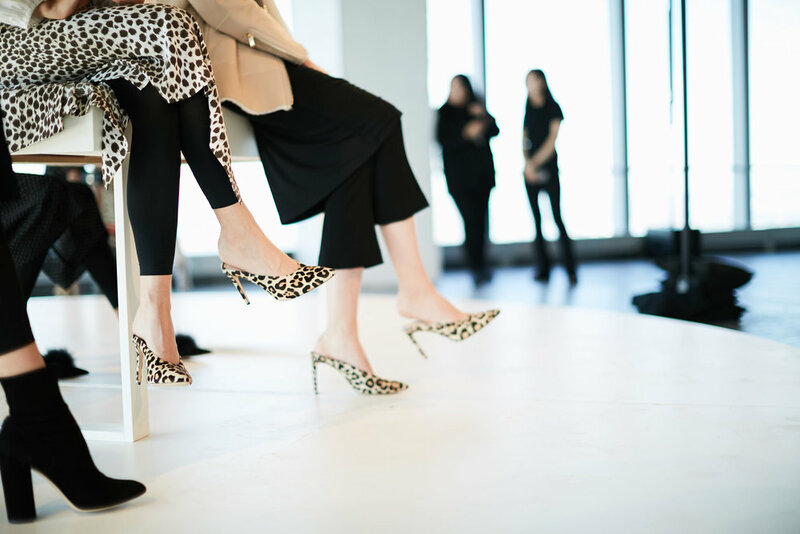 I added some images of the models, so you guys can see some of my favorite trends this season: Lots of leopard print, bold shoulders, and leggings are back in a big way! Then I headed back to midtown for the Kate Spade presentation! They held the event at the Oyster Bar in Grand Central!!! How much fun is that?! I've been a fan of Kate Spade for as long as I can remember, so seeing the brand grow in such a fun, girly, and whimsical way has been inspiring! After Kate Spade I headed to Hotel Rivington on the LES to hang with the Reward Style team! I loved meeting so many amazing bloggers that I follow on social media in person! This was a great way to chill and chat before headed out for the rest of the day. After, I headed to the Milly presentation in SoHo. I WAS OBSESSEDDDDDD!!! I felt like I was in a room of rainbow fairytale dreams, and I couldn't have loved all the pieces more! Can't wait to share more of Milly's collection with you this fall! I then did my only quick change of the day, and headed directly to a brand of I have been loving called All Things Moochi!!! I’ve been following their success for quite some time now. The new collection is was very Mexican inspired. The presentation was loud, colorful, and fun - All my favorite things when it comes to branding! I instantly got into vacation mode.... anyone want to take a trip somewhere?! Anyways, I completely missed the backstage portion of the show with GLAMSQUAD because I was in SOOOO much traffic :( I quickly got over my sadness, and geared up for the presentation. There were tons of safari and military vibes going on... And I can definitely get into that! To end this crazy day I headed to the Marled event in Tribeca, and had myself a time! Not only was there beautiful comfy clothing, BUT also Shake Shack!!!! I was freaking out. It was a fabulous way to end Day 2!!! Stay tuned for Day 3!! !